Every year, too many people die because we don’t put down our phones while driving. THIS HAS TO STOP! That’s why Nissan supports the #RedThumb Movement. This cause was started by a man named Steve Babcock who painted his thumbnail red to remind himself to put down his phone while driving, igniting a movement. Safe driving is important to Nissan so they’re taking action to reduce fatalities by encouraging people to turn their thumbs red and pledge to put their phones down while driving. You can find out more about the #RedThumb movement and how Nissan is supporting it here: http://www.nissanusa.com/redthumb/. 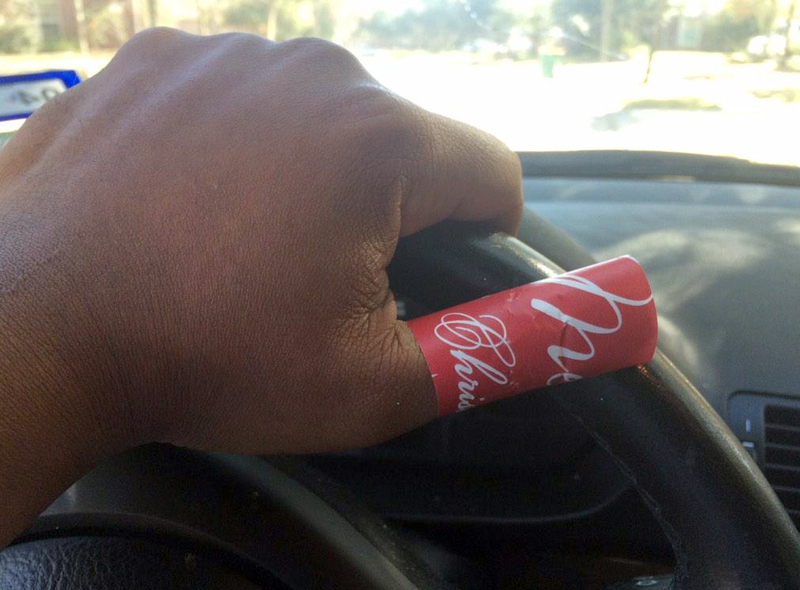 If you’d like to take the #RedThumb pledge, Mocha Man Style is offering you the chance to win a $25 Cash Card and a Red Thumb Kit which includes a Red Thumb Band, Red Thumb Stickers, Dashboard Grip Pad and a T-shirt. To enter the sweepstakes, show your support by creatively turning your thumb red. This could include buying bright red yarn to tie on your thumb, red duct tape, or something as simple as using red permanent marker. Once you’ve taken the pledge and your thumb is red, we ask that you share a photo on social media using #RedThumb, @mochamanstyle, @NissanUSA. Leave a comment below with the link to your post. The #RedThumb Movement Sweepstakes starts on Wednesday, December 16, 2014 and ends on Monday, December 22, 2014 at 11:59 a.m. (EST), and is open to all Mocha Mocha Man Style readers, subscribers, and/or fans 18 years old and older in the continental U.S. and Canada. No purchase required. Relatives and employees of Goodall Family Media are not eligible to win. You are also ineligible if you’ve won a prize from this website within the past 30 days. Two (2) winners will be chosen via Random.org and announced soon after the ending date. You must leave your contact information to collect your prize. If a winner does not respond within 3 days, a new winner will be chosen. Disclosure of Material Connection: I received compensation and/or one or more of the products or services mentioned above for free in the hope that I would mention it on my website. I am disclosing this in accordance with the Federal Trade Commission’s 16 CFR, Part 255: “Guides Concerning the Use of Endorsements and Testimonials in Advertising.” All opinions are my own. Allow 3-6 weeks for giveaway fulfillment. Total prize value = $50. To see the winner, visit our Winners Page.